Simple and intuitive control with the Focus 3 terminal. 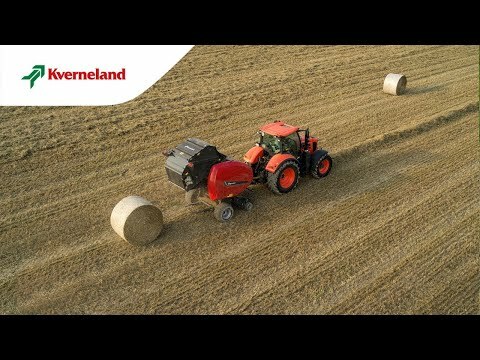 The Kverneland 6600 bale chamber offers a combination of 2 rollers and 5 wide laced belts. This mixed chamber ensures a smooth bale start whatever the intake system, offering smooth bale rotation and reduced crop loss, even in dry conditions. The two aggressive front rollers that come in contact with the crop are constantly cleaned by scraper rollers and are designed to perform well in all conditions. They ensure instant and efficient bale start with every type of crop. The small pre-chamber at the start of the bale formation ensures well-shaped and dense bales with a moderate core and tight outer layers. As the bale grows, the belt tensioning arm is subjected to steadily increasing resistance from two hydraulic cylinders and a spring tensioner. So as the bale diameter grows, so does the bale’s density. The result is a very firm bale with a moderate core. 2.0 or 2.2m pick-up with small diameter pick-up reel for fast and efficient throughput. Pick-up with 4 or 5 rows of tines respectively. Twin cam tracks on the 2.2m wide pick-up. Tine bars with two central supports on the 2.2m wide pick-up. Roller crop press is standard on the 2.2m wide pick-up.